Gentrification is often viewed suspiciously by heritage purists. But in Portugal, with its storied past and 15 Unesco World Heritage Sites, the classic and vintage coexist beautifully with the young and vibrant. It is fun getting lost in the cobblestoned alleyways of Porto, Portugal's second largest city, the country's mercantile hub which is also increasingly chic and bohemian. Among the urban upstarts who are part of the scene is Mr Yoske Nishiumi, a Tokyo native who owns a boutique in a creative space on the outskirts of Porto's tourist drag. I come across shops such as Nishiumi's Out To Lunch (www. facebook.com/OTLStore), its quirky moniker quite the misnomer because the Portuguese, unlike their Spanish neighbours, are not big on afternoon siestas. Or The Feeting Room (Largo dos Loios, 4050-338 Porto; www.facebook.com/thefeetingroom), which bears the tagline, "Yes, I am a shoe-aholic. No, I don't need help", and reminds me of fashion shops Rockstar and The Redundant Shop in Singapore. Several carriers fly from Singapore to Portugal - either Lisbon or Porto - with transits in Istanbul, Dubai, London or Paris, depending on the carrier. Guests on the Insight Vacations 10-day Country Roads of Portugal Tour (prices from US$2,465 or S$3,370) travel in a tour bus with free Wi-Fi and plenty of legroom. For more details, go to www.insightvacations.com or call 6922-5950/6922-5978. Nishiumi's Out To Lunch sits right at home among other cafes and apparel shops at shiny pocket mall Galerias Lumiere (16, Rua de Jose Falcao 157, 4050-317 Porto; open: 11am to 8pm, Monday to Thursday, 11am to midnight, Friday and Saturday, closed on Sunday; www.facebook.com/galerias.lumiere), which is located among dilapidated shuttered shopfronts and graffitied buildings - possibly a ghost of the economic downturn of 2008. Mr Nishiumi, 48, tells me in fluent English he uprooted from Tokyo more than a decade ago to escape the stifling salaryman culture, first to Berlin as a party organiser and then to freewheeling Porto, where he has now set up shop. I meet him by chance, as I wander off alone in Porto during my 10-day round-country trip in Portugal with Insight Vacations (www.insight vacations.com). I must profess I am usually not one for guided tours. But I appreciate how it brings me around the country to lesser-known areas as diverse as walled cities, ancient ruins and beachside resorts. I also like that guests on my trip have the luxury of leaving the group and venturing off on our own. Mr Nishiumi sells European apparel, from shoes to shades, and indie magazine titles such as The Travel Almanac. But his bestseller is still a tote bag, handsewn by a 95- year-old obaasan (Japanese for grandmother) of a friend back home. Part of the trendy set who has capitalised on the affordable prices in the city, as evident from its lively arts, design and nightlife scene, he fills me in about creative parties at a loft-like space called Maus Habitos, or Bad Habits in Portuguese, which hosts concerts, plays, artistic exhibitions and dance parties (Rua de Passos Manuel 178, 4 Piso, 4000-382 Porto; tel: +351-222-087-268; www.maushabitos.com). Indeed, a recent documentary by lifestyle magazine Monocle also lauds Porto's visual identity. Instagrammers who curate their feeds with artistic shots will not be hard- pressed to find picture-perfect nooks and crannies here. But there is also something for the traveller with an eye for a slice of history. In fact, the entire city centre overlooking the mouth of the Douro River is more than 2,000 years old and was conferred the Unesco heritage site honour in 1996. As the Unesco website says of the city: "The rich and varied civil architecture of the historic centre expresses the cultural values of succeeding periods - Romanesque, Gothic, Renaissance, Baroque, neoclassical and modern." In central Porto, the Sao Bento train station, which dates back to 1916, takes my breath away with its 20,000 azulejo panels. Azulejo is a tin-glazed blue ceramic tilework common throughout Portugal, but especially spectacular here in Porto's main train station, with the tiles telling stories such as the Battle of Valdevez of 1140 and the Conquest of Ceuta of 1415. Even older than that is the magical Livraria Lello (Rua das Carmelitas 144, 4050-161 Porto; open: 10am to 7.30pm, Monday to Friday, 10am to 7pm, Saturday, closed on Sunday), cited in many tourist guides as one of the most beautiful bookstores in the world. Built in 1881, its lavish architecture, replete with floor-to-ceiling bookshelves and ornate spiral staircases, is rather fairy tale-like. Porto natives will tell you with pride that the bookstore must have inspired scenes in the Harry Potter series, because author J.K. Rowling was married to Portuguese television journalist Jorge Arantes in 1992 and once lived in the city. They separated a year later. Even the winemakers and their port wine are generations old. No trip to Porto is complete without a wine tour and I thoroughly enjoy learning about the tradition behind the tasty wines of Ferreira Cellars (€6 or S$9 a tour; Avenida Ramos Pinto 70, 4400-082 Vila Nova de Gaia; tel: +351-223-746-106; www.sograpevinhos.com), which was founded in 1751. Or kick back at the alfresco bar at Sandeman (Largo Miguel Bombarda 3, 4400-222 Vila Nova de Gaia; tel: +351-223-740-500; www.sandeman.com), a label established in 1790, over a tipple and watch the world go by. My glass of Sandeman Bliss, concocted from Sandeman Tawny Port wine, orange slices and cinnamon topped with sparkling lemon water, is a welcome respite from the summer heat and reminds me of a sweetened old-fashioned cocktail. It is here, on the eighth day of my trip, that I reflect on the stunning sights I have encountered in a country that must be an overlooked gem. Portugal was once a superpower, a conquistador of foreign lands from Brazil to Macau. So wide was its influence that Portuguese is among the most spoken languages in the world today. 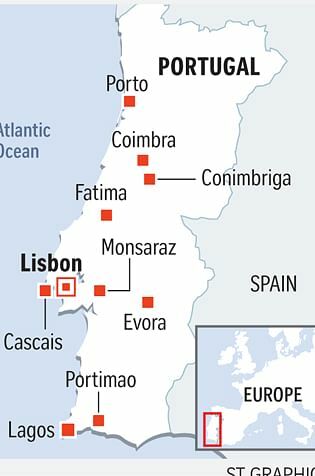 Man-made relics of centuries past, such as walled fortresses and Roman ruins, bear witness to Portugal's rich history, which itself has seen occupying forces such as the Romans, Muslims and Jews. And if you are hungry for a taste of nature, there are also spectacular rolling hills and Mediterranean beaches. My journeystarts off in Lisbon, Portugal's largest city and capital. No trip there is complete without a pit stop for Portuguese egg tarts at the famous Pasteis de Belem (Rua Belem 84-92, 1300-085 Lisboa; open: 8am to midnight from July 1 to Sept 30, 8am to 11pm from Oct 1 to June 30; tel: +351-213-637-423; www.pasteisdebelem.pt), which has been in business since the 1800s. It bakes at least 20,000 tarts every day, each caramelised custard sprinkled with cinnamon powder a delightful sweet treat. At night, I am enthralled by the bluesy strains of fado, a melancholic form of folk music that is on the Unesco intangible cultural heritage list. Also, get a tan basking under the sun on the pristine white sands at seaside villages Cascais near Lisbon, Lagos or Portimao, all of which offer stunning views of the expansive Atlantic or the Mediterranean. Another must-visit is the charming town of Evora, which is home to winding streets and encircled by ancient aqueducts that used to bring water to residents. Its most famous landmark has to be the Capela Dos Ossos, or Chapel of Bones, which was built in the 16th century by a Franciscan monk who wanted his brothers to contemplate the transcendent nature of life. The skulls and skeletons of more than 5,000 adults and children are packed tightly along the walls and pillars of the chapel, making for a chilling sight. Inscribed over the entrance is the sentence: "Us bones that are here, for yours we await." What I enjoy most is the town's contrasts - it is historical with relics of the past, yet brims with youthfulness as Portugal's second- oldest university is located here. Temperatures in the land-locked town are sweltering in the day, but the morning breeze makes it ideal to lace up and join like-minded locals for a run around the lovely town, past sites such as the remnants of a mediaeval temple built from 14 granite columns from the days when the Romans conquered Evora more than two millenia ago. In Evora, I stay two nights in the luxurious M'Ar De Ar Aqueduto boutique hotel (Rua Candido dos Reis 72, 7000-782 Evora; tel: +351-266-740-700; www. mardearhotels.com), a refurbished 16th-century convent. Its rooms, with their stark architecture, high ceilings and wooden furnishings, look at home in any interior design magazine. Plus, the hotel's eclectic vibe reminds me somewhat of the W group of hotels. A day trip away from Evora is the walled city of Monsaraz, today virtually a ghost town with only a population of 782, yet it is one of the oldest Portuguese settlements. There, I wander among whitewashed houses and climb granite battlements of the local castle for a bird's-eye view of the countryside. The tour also brings me to the holy village of Fatima, which is famous as a place of pilgrimage for Catholics. This is where three young children are said to have seen apparitions of the Virgin Mary in 1917 and at the town square is a Chapel of the Apparitions. The modern Church of the Most Holy Trinity, which is said to be the fourth-largest Catholic church in the world, has been criticised for looking stark. But it is precisely its simplicity - unlike other churches in Portugal, or Europe for that matter - that makes it breathtaking to me. I am not Catholic, but leave Fatima surprised by the indescribable positive energy and peace I find in the city. Yet another highlight are the towns of Coimbra and Conimbriga, a stone's throw away from one another, Conimbriga, a Unesco World Heritage Site, is Portugal's best- preserved Roman archaeological site and has ruins that tell an intricate story of Roman rule on the Iberian peninsula during the third century. In the nearby town of Coimbra, I am awed by the massive, spacious courtyard of the local university built in 1537. I can imagine Portuguese undergraduates scuttling from class to class across the courtyard at the public university, under the watchful statue of King John III. He reigned over Portugal from 1521 to 1557, a period when the Portuguese empire expanded rapidly to Brazil and East Asia. A must-see there is the Joanine Library, with its Baroque features and balustrades made of golden leaves and tropical wood. Today, it houses about 56,000 books dating from the 16th to 18th centuries on topics such as law and medicine. Indeed, from the ancient to the new, the vintage to the trendy, there is much splendour in Portugal and I leave with a sense of bliss. I'm sure that's not my glass of Sandeman Bliss talking. •The writer's trip was sponsored by Insight Vacations.